Well This Is Rather Alarming: Nearly 6,000 Gas Leaks Discovered In Washington, D.C.
You've never wanted a city-wide smoking ban more than this. 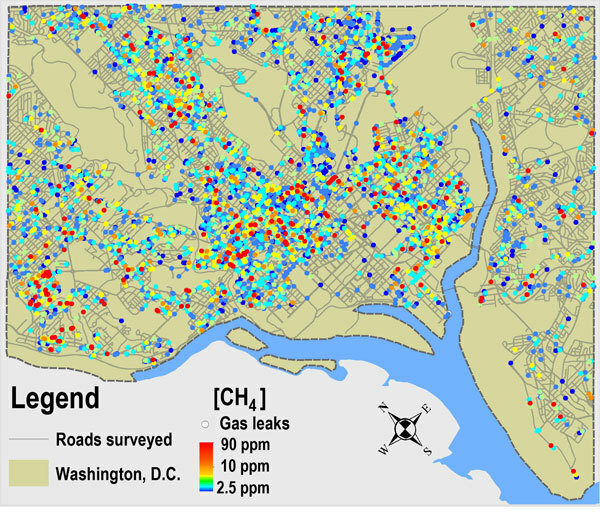 An alarming new report put out in the journal Environmental Science & Technology finds nearly 6,000 natural gas leaks around Washington, D.C. And it gets worse. Way, way worse. The leaks were first discovered a year ago -- then, 19 of the leaks were found to have high concentrations of methane, the primary ingredient in natural gas, and 12 had high enough levels to cause explosions, according to USA Today. Four months later, after presenting their findings to D.C.'s utility, the researchers from Duke, Stanford and Boston University went out to check on Washington's gas problem again. They found the wrong kind of gasbags around the nation's capital. Driving a GPS-equipped car outfitted with a "high-precision Picarro G2301 Cavity Ring-Down Spectrometer," according to a news release put out by Duke, the scientists discovered nine leaks still spewing dangerous methane levels. "Finding the leaks a second time, four months after we first reported them, was really surprising," Duke professor Robert B. Jackson, the study's leader, said in the news release. "If you dropped a cigarette down a manhole ... it could have blown up," he elaborated to USA Today. "I was shocked." About as shocked, we'd imagine, as Georgetown Cupcake customers were when a manhole cover explosion led to the store's evacuation, last March. Washington Gas officials declined to answer questions about the study, but Eric Grant, the utility’s vice president of corporate relations, issued a statement saying that it maintains “rigorous inspection programs, operating procedures and record-keeping protocols. Washington Gas practices exceed the leak detection and repair procedures that are required by code, enforced by federal agencies and overseen by each state’s public service commission.” The statement said the company has 13,000 miles of distribution mains and more than 940,000 service lines in its system. Betty Ann Kane, chairman of the District’s Public Service Commission, said there has never been an explosion of leaking natural gas in her eight years on the panel. Under orders from the commission, Washington Gas is aggressively replacing older cast-iron mains and a type of pipe coupling that has leaked elsewhere, she said. Jackson emphasized to the Post that there isn't a correlation between income or race and where the leaks are located, saying that “It’s not a social justice issue." However since methane is not just the primary ingredient in natural gas, but also a major contributor to climate change, it is an environmental issue. "Climate-wise," Jackson said to USA Today, "it's potentially a big deal."